On January 6, 2018, members of District Council 57 participated in an anti-wage theft demonstration on behalf of four immigrant workers who weren’t compensated for their work. The workers were a group of painters who helped paint the Courtyard Marriott Hotel on Campbells Run Road in Pittsburgh, Pennsylvania. The job’s sub-contractor, A.C.B. Floor Design Inc., had won a subcontract to do painting and other work at the hotel from general contractor National Custom Inc. A year has passed since work at the Courtyard Marriott was completed, yet the painters still haven’t received their paychecks. A.C.B. Floor Design Inc. owes these workers $13,000.00 for their labor. Although the painters aren’t union members, DC 57 deemed it necessary to stand up on their behalf. “We stand up against wage theft regardless,” said Joe Hughes, field representative for DC 57. “Wage theft is rampant in hospitality construction. We’re putting pressure on the hospitality industry to address this problem.” Five other members from DC 57 joined Brother Hughes, including Dave Sell (LU 409), Tom Flook (LU 6), Steve Olash (LU 530), Dave Wayman (LU 2006) and Don Slabe (LU 6). Other organizations present at the demonstration included the Pittsburgh Chapter of the Labor Council for Latin American Advancement, Thomas Merton Center, and the Pittsburgh Chapter of Asian Pacific American Labor Alliance. 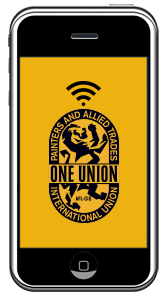 The International Union of Painters and Allied Trades thanks our members at District Council 57 for continuing to stand up for working people. 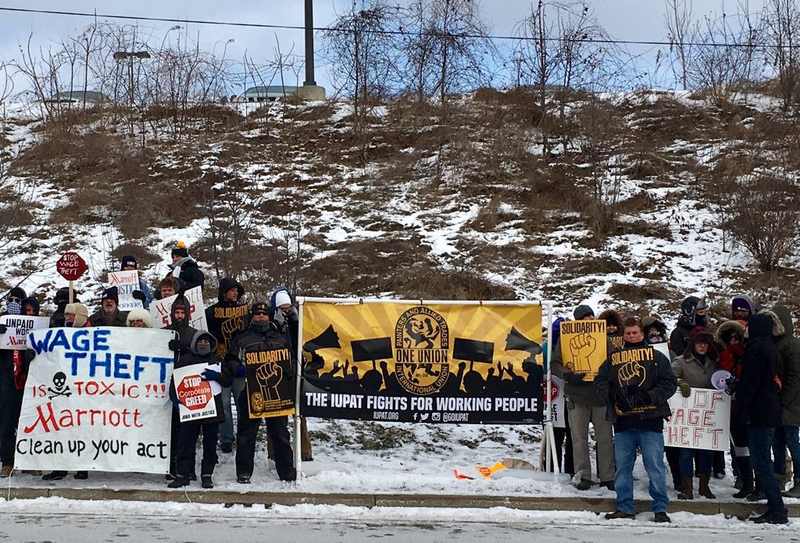 Members of District Council 57 showed their support during an anti-wage theft demonstration for four immigrant workers who haven’t been compensated for their time and expertise at the Courtyard Marriott in Pittsburgh, Pennsylvania.